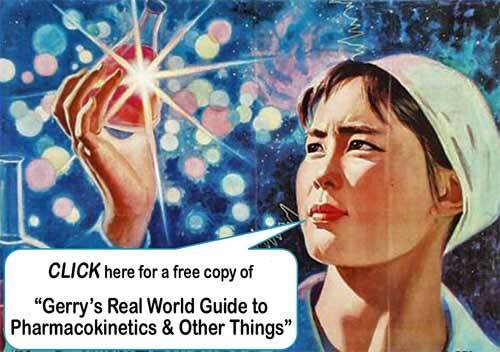 Gerry's Real World Guide to Pharmacokinetics & Other Things is a unique and powerful new way to learn about the "real world" pharmacodynamics and pharmacokinetics of anesthetic drugs. Anesthesiologists with insight in the physiology of the pharmacodynamics as well as the pharmacokinetics of anesthetic drugs are specialists whose knowledge enables them to be inventive with the use of available drugs, to intelligently modify the use of these drugs according to the condition of each patient, as well as to rapidly learn the uses of new drugs. .
Gerry's Real World Guide to Pharmacokinetics & Other Things is a unique textbook teaching the elements of the pharmacodynamics and pharmacokinetics of anesthetic drugs in the form of dialogues between Dr. Gerry, a crusty, curmudgeonly older anesthesiologist, with a serious coffee addiction and attitude problem, and Dr. Bob, his sometime surly and unwilling resident. Such bedside teaching is the way anesthesia residents learn how to administer anesthesia and think about anesthesiological problems. This book explains the elements of the pharmacokinetics of anesthetic drugs from the viewpoint of a practical clinician with a minimum of mathematics. In fact the most advanced mathematical techniques used are addition, subtraction, multiplication - and hold on to your socks - division! Understand the way you use anesthetic drugs in daily practice, because you now understand the pharmacokinetic and pharmacodynamic properties of these drugs, and the physiological basis of these properties. Understand why anesthetic drug use differs between people with different diseases and body types, because you now understand the pharmacokinetic and pharmacodynamic properties of these drugs, and the physiological basis of these properties. Improvise new ways of using existing anesthetic drugs, because you now understand the pharmacokinetic and pharmacodynamic properties of these drugs, and the physiological basis of these properties. You will be able to predict how to use new drugs in a minimum of time, because you now understand the pharmacokinetic and pharmacodynamic properties of these drugs, and the physiological basis of these properties. This is knowledge and expertise which may be expected of all physicians specializing in anesthesiology. Gerry's Real World Guide to Pharmacokinetics & Other Things makes learning all these things painless and simple using a teaching technique unique among medical textbooks. 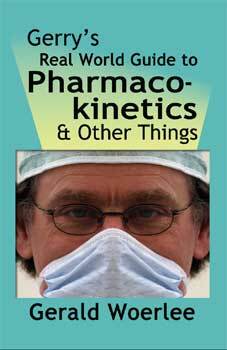 Gerry's Real World Guide to Pharmacokinetics & Other Things has been available in Europe since the end of 2005, and is now available in the USA! Here is what some reviewers have said about this book. � this is a delightful and well-written book which succeeds in its aim of teaching pharmacokinetics and will be a welcome relief to any trainee studying for professional examinations. It deserves a place in any trainees pre-examination reading list and should be saved up as a treat for the dark days when exam preparation is becoming almost unbearably tedious but the exam is still some time away. My copy will be well thumbed in an attempt to make sure that future generations of anaesthetic trainees can tell the examiners something meaningful about the mysteries of pharmacokinetics and drug disposition! � it has been my bias that serious tomes on pharmacokinetics and dynamics are 'inhibitors' to the majority of anesthesia practitioners and learners. In his slim paperback text, "Gerry's Real World Guide to Pharmacokinetics and Other Things", G.M. Woerlee has done a tremendous job of avoiding this pitfall, and has created a highly approachable text for all anesthesia practitioners. "Gerry's Real World Guide to Pharmacokinetics & Other Things"
2. Asleep in ten seconds! Speed of anesthetic induction / The Koran and unconsciousness / Cause of hypotension after induction / Bombs on Pearl Harbor / Calculating effects of induction during hypovolemia / How fast will I lose consciousness after decompression at 10,000 meters altitude? Renal failure and muscle relaxants / You can use any relaxant you want! / Dual block misconceptions / "Ohhhh, the suffering, the suffering..."